Among the countries of Southeast Asia, Thailand holds special and resilient relationships with all of the major powers that are the region's movers and shakers. Thailand should better harness its resilient relationships with all the major powers that are the region’s movers and shakers, namely China, the United States, and Japan, to strengthen the country’s international standing. While its neighbours have had prickly relations in the recent or distant past with either China or Japan, Thailand is counted as a valued partner through the contemporary thick and thin by both Beijing and Tokyo while all the while remaining a formal ally of the United States. It is these special relationships with major powers in the constellation of regional relations that Thai policymakers must cultivate and harness to advance Thailand's role and standing on the global stage in the months ahead. The formal alliance with the US is the most conspicuous. Bangkok signed the Manila Pact in 1954, which established a precursor to Asean known as the Southeast Asia Treaty Organisation, cemented by a joint communique between the two countries in 1962 as the Cold War intensified. Ties began almost 180 years ago, but Thai-US relations reached a contemporary peak in June 2003 when former premier Thaksin Shinawatra visited former president George W Bush at the White House and returned with a package of reciprocal benefits. Thaksin enticed the Bush administration into starting negotiations for a bilateral free-trade agreement and classifying Thailand as a "major non-Nato ally" in exchange for sending Thai troops (mainly in medical and engineering supporting roles) to assist in the US-led wars in Afghanistan and Iraq. Thailand also signed up for the Container Security Initiative and provided exemptions for US personnel in legal cases involving the International Criminal Court. Not since the Cold War, in which Thai soldiers fought alongside American GIs in the Korean and South Vietnam theatres, had Thai-US relations been so invigorated. After the military coup ousted Thaksin in September 2006, partly owing to the bilateral trade negotiations which skirted around civil society scrutiny, Thai-US relations went increasingly astray, held hostage by Thailand's domestic political volatility and turmoil. The Americans have tried during the post-coup period to "revitalise" this bilateral alliance, one of its five major bilateral treaty spokes in East Asia, in both Track I and II endeavours, but thus so far to no avail. The Thai-US alliance is certainly not what it used to be, and appears in need of a complete revamp. China is different vis-a-vis the US. Unhindered by input-output bottom lines and accountability requirements like the Americans, the Chinese have deftly fostered cosy ties with Bangkok. Thai-Chinese relations have warmed to levels unseen since the anti-Vietnam years when Thailand was Asean's frontline state in the stand-off against the Hanoi-backed Heng Samrin regime in Phnom Penh, a united front that included the Beijing-supported Khmer Rouge. While Thai-Chinese ties have not been estranged since their normalisation and Bangkok's adoption of the one-China policy in the mid-1970s, this subtle but deepening bilateral partnership has never been closer. It is reinforced by the role of the overseas Chinese, who became economically integrated and ethnically seamless entrepreneurs in Thai economic development over the past century. As China towers over the 21st century, Thailand's natural omnidirectional hedging between the major powers has also augured well for the Bangkok-Beijing axis. China was the only major power to recognise Thailand's putsch in 2006 and allowed high-level contact with coup-appointed government officials. In recent years, more Thai middle-ranking military officers have been heading for training in China than ever. Thai-Chinese ties have been bolstered by annual joint military exercises since 2003, and Thailand was the first Southeast Asian country to host the People's Liberation Army on its territory. The same can be said of the unprecedented number of Thai students receiving scholarship opportunities to study in China. More Confucius institutes dot the Thai landscape than in any other Southeast Asian country. Much of the recent deepening of Thai-Sino ties started in the late 1990s when Thailand's most devastating economic crisis in decades was met with Chinese goodwill, aid and loans, while the US Treasury stood by in favour of a painful IMF bailout package. For the Chinese, the Thai front was about open-ended relationship-building for long-term strategic gains rather than short-term manoeuvrable benefits. Such a long-term view is enabled by the continuity and long periods of stable Chinese leadership and a top-down authoritarian system that can decide and implement long-range planning. To be sure, the US also went along with the coup in its own way apart from democratic rhetoric and the automatic suspension of IMET (International Military Education and Training programme), as can be gleaned from the WikiLeaks cables. But ironically Washington has not reaped the same credit. China also provides sanctuaries and mobility for Thaksin and a frequent home for HRH Princess Maha Chakri Sirindhorn. Tellingly, Thaksin's visit to the US in August 2012 elicited howls of protest and a demonstration in front of the US embassy in Bangkok, whereas his regular appearances in China and Hong Kong were treated as par for the course in Thailand. The request by the US National Aeronautics and Space Administration to conduct a joint study on climate change with Thai counterparts, which was viewed by anti-Thaksin elements with suspicion, had to be cancelled in June this year. Thailand has veered towards Beijing for understandable hedging and interest-driven reasons but its relative drift away from Washington is a conundrum. Revitalising Thai-US relations first and foremost requires an admission and a prognosis of this drift. Insisting and pretending otherwise can only play into Beijing's hands, which is beneficial neither to Washington nor Bangkok, which aspires for a balanced footing among the major powers. 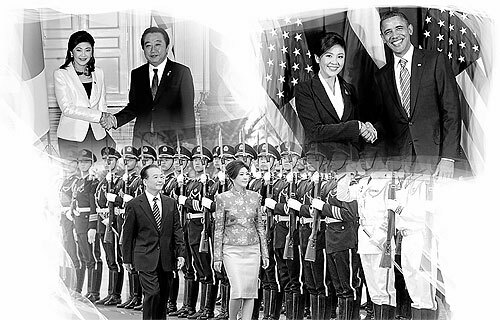 Beyond China and the US, Thailand's true and fortuitous friend is Japan. When the region was ravaged by World War II, the characteristic disunity of Thai leaders saw Bangkok end up officially on the losing side with Japan. Unlike their regional peers, Thais harbour no ill will stemming from the 1940s towards the Japanese. And the Japanese know it. Bangkok is their longstanding economic springboard, a regional headquarters of choice that suits and caters to Japan's interests and preferences. Recent China-Japan tensions have caused a rethink among Japanese corporates, and more of them are likely to look away from China towards Southeast Asia with a sway towards Thailand for production and industrial support networks. Yet other major powers have made growing forays into Southeast Asia. India's "Look East" policy over the last two decades has made a limited impression, and huge power problems in India have brought Indian strategic wherewithal into doubt. But Thailand has always been close to India on the people-to-people Track III. India provided the roots of Thai culture and religion. Thousands of students have been boarding in the Indian foothills for decades, even when India was more insular and its economy leaning towards socialism. As the "new" Japan, South Korea's impressive rise along with Dae Jang Geum and Gangnam Style to an OECD country and growing "middle power" status bode well for Thailand. Unlike China and Japan, it is an East Asian country where Thai ordinary passport holders do not need a visa to visit, thanks to Thailand's contribution in the Korean War in the early 1950s. Seoul in the Northeast and Bangkok in the Southeast form an ideal geographical partnership of like-minded countries with similar backgrounds. More can be made of Thailand's promising ties with other rising regional middle powers such as Australia. Even Russia, a new member of the East Asia Summit, enjoys a special friendship with Thailand. This optimal and unrivalled mix of major powers in Thailand's orbit has not been sufficiently harnessed and utilised to advance Thailand's international standing. If the leadership gets its act together, Bangkok could help broker the mending of Northeast Asian tensions and conflicts. Thailand's international problem is its domestic situation. But even so, much more can be made of its relationships with the major powers without impinging on the raw and touchy domestic cut-and-thrust. The writer is Director of the Institute of Security and International Studies, Faculty of Political Science, Chulalongkorn University.